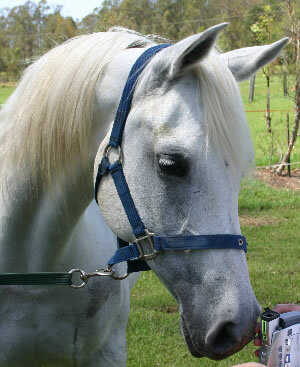 Silver Crescent was bought from Kamana Arabians in NSW in November 2007. After a long wait this beautiful pure Crabbet mare finally arrived at Aurora Stud in mid November, following delay’s caused by Australia’s equine influenza outbreak. 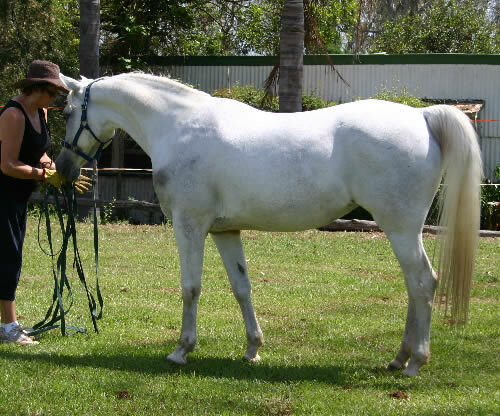 Silver Crescent was not bred from before her sale but came to us due to foal to Boomori Finale, whom the Swans still own in Australia. Cressy, as she is known affectionately, boasts the very strong Silver Family line. She does not have any Sindh or Greylight blood. 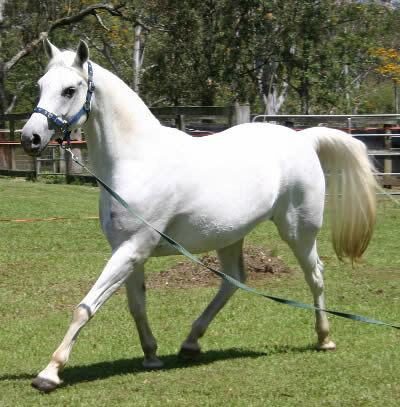 Her paternal grandsire, Somer’s Magic, is a full brother to Silver Omen. She has had three foals for us; the pure Crabbet mares Aurora Clouded Moon, a beautiful filly by Boomori Finale, and Aurora Southern Star, by Silver Omen; and in 2013 she foaled a colt by the Polish Arabian sire Pilot, named Midnight Diamond.